Our resource library includes a wide range of documents and resources created and curated by Philanthropy Northwest. Our members can log in to access specialized digital resource centers on advocacy, arts funding, disaster philanthropy and impact investing. The search filters found on the right sidebar search our resource library. To narrow your search, select more checkboxes. To broaden your search, uncheck search boxes. You can also do a keyword search with the search field below. The search field can be used in combination with filters. The search field at the top of the page searches the entire Philanthropy Northwest website for events, news and resources. JK Group, a leading software and value-added services provider for corporate philanthropy has released a white paper that addresses the current state of corporate philanthropy and offers employers key insight on how they can build robust giving campaigns that resonate with employees, drive engagement and help the larger community. Members of the White House Council for Community Solutions and Bridgespan look at exemplary collaboratives making needle-moving progress on key challenges facing their communities. 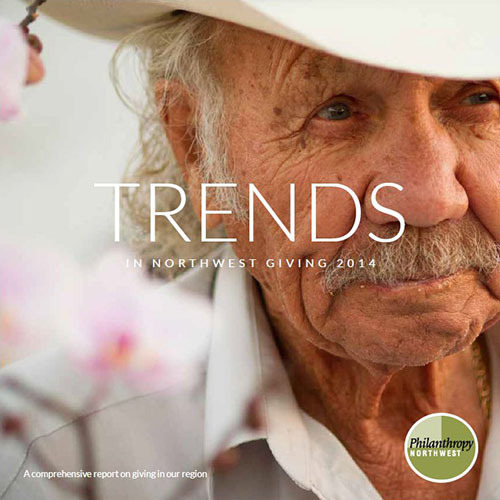 Trends in Northwest Giving is Philanthropy Northwest's biennial report on organized philanthropy in our six-state region (Alaska, Idaho, Montana, Oregon, Washington and Wyoming). Our 2014 edition analyzes 24,013 grants to Northwest organizations from 245 funders in 2012, totaling $979,171,356. In-depth information on foundation and corporate grantmaking in each Northwest state, along with a list of the top 10 funders in each state and detailed breakdowns of giving across issue areas. Written by Daniel Kemmis and published this in collaboration with the Kettering Foundation, this monograph offers both an appreciative history and some probing questions grounded in current events. We believe that there is an intimate and vital connection between philanthropy’s aspirations to build a better society and the daily practice of democracy and civic engagement. Produced in partnership with the D5 Coalition and the Seattle University Nonprofit Leadership Program, "Vision and Voice" is the product of a year of research and dialogue with northwest foundation leaders about issues of diversity, equity and inclusion in philanthropy. It includes findings from interviews with 23 regional foundation leaders and an in-depth exploration of a unique peer cohort we facilitated, consisting of 10 leaders who met on an ongoing basis to discuss and support each other in advancing diversity, equity and inclusion in their organizations. "Listening and Learning" is a vehicle for sharing the knowledge created in our region. It draws on the work of our members, regional partners and convenings of grantmakers. Through this vehicle, we share best practices, trends and continuing questions. The Listening and Learning series collects and shares latest practices and knowledge. Published in 2011 by Philanthropy Northwest, the report describes work in Indian country. A snapshot of Philanthropy Northwest's work in building civic capacity and strengthening civil society. Philanthropy Northwest reports on 2010 grant program to Community Foundations.